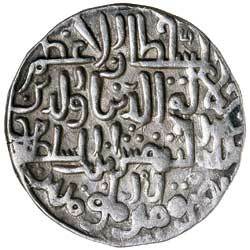 SULTANS OF BENGAL, Jalalat al-din Radiyya, struck in his name as Sultan of Delhi (A.H. 634-637, A.D. 1236-1240), Silver tanka, [Lakhnauti] Mint, name off flan, (10.71 g), date off flan but probably AH 634 (1236 A.D.), (G&G B56). 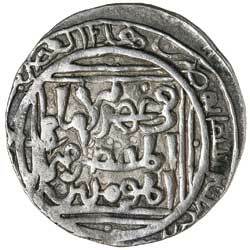 Very fine, off centred obverse and rare. Ex Dr V.J.A. Flynn Collection and Baldwin's Auction Sale 53, 25 September 2007, (lot 1631). Radiyya was the daughter of Iltutmish, and the only female ruler in the whole of the Indian sultanate series.